The Gallery Collection is thrilled to have the opportunity to make a donation to Warrior Canine Connection. We created and donated 500 Thank You cards to be used to give thanks to Veterans for everything they have done for our country. 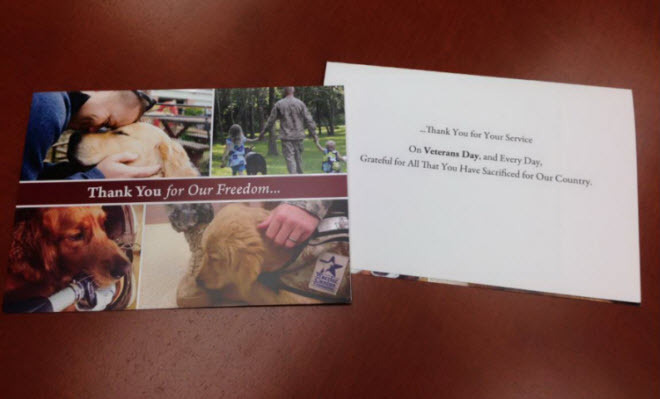 Using images supplied to us by Warrior Canine Connection, we’ve created a card that speaks to both the work that the organization does, and the grateful thanks they wish to share with Veterans. Warrior Canine Connection is a pioneering organization that utilizes clinically based Canine Connection Therapy to help wounded Warriors reconnect with life, their families, their communities, and each other. By interacting with the dogs as they move from puppyhood to training to adult service dogs, Warrior Trainers benefit from a physiological and psychological animal-human connection. As a result of their efforts, Veterans with disabilities receive the finest in trained service dogs. I love this card! And I love more what it stands for – I am an animal lover and this card really makes it real. The dogs should have recognition they are soldiers and officers. They are on the front line with the men and women out there. Love that Gallery Collection has so many wonderful things they donate to. It is truly wonderful that the Gallery Collection donates to this great cause. I have several members of my family who served in the armed forces and some of them suffer from PTSD. It’s good to know that Warrior Canine Connection is helping soldiers to heal emotionally for these are often the wounds that go untreated for our veterans. This reminds me of Balto. It was an animated movie of a dog who helped save children by travelling many miles in the snow to pick up some medicine. You have to watch it! There’s a statue of him in Central Park in New York. I heard on the news the other day that many of the homeless are veterans. We need to do more to help them and donations like this makes a difference.